How to set shadows for plot area or axis in chart using XlsIO? This article explains how to set shadow to plot area in chart using XlsIO. The plot area in a chart or graph refers to the area of the chart that graphically displays the data being charted. 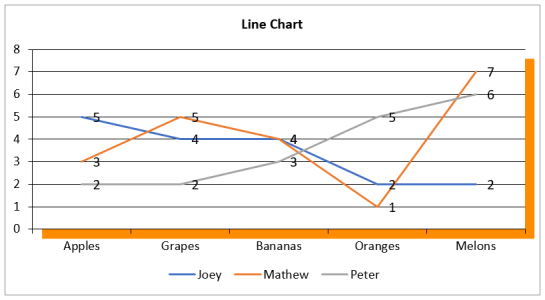 The plot area of a 2-D chart contains the data markers, gridlines, data labels, trendlines, and optional chart items placed in the chart area. Whereas the plot area of a 3-D chart contains all the above items along with walls, floor, axes, axis titles, and tick-mark labels in the chart. Create a chart object by calling the worksheet.Charts.Add method and specify the chart type to ExcelChartType.Line enum value. Add basic chart elements like chart title, legend and datalabels. Set shadow to plot area in chart using properties in IShadow. Note : We can set shadow to plot area in chart using CustomShadowStyles method as well. The following C#/VB complete code snippet explains how to set shadow to plot area in chart using XlsIO.